I buy books based on their covers all the time! :) And have you seen the cover art for book 2? It's gorgeous. I agree, it's lovely that Lila and Kell grow to care for each other so slowly, no instalove here! I wonder what's going to happen with them in the sequel(s). I'm a total "cover grazer" in that I'll pick books off of the shelves in bookstores based on how their covers look. I figure, hey, someone went to a lot of trouble to create that art...may as well enjoy it! I love the sound of the antagonism - and the initially reluctant friendship - between Lila and Kell. 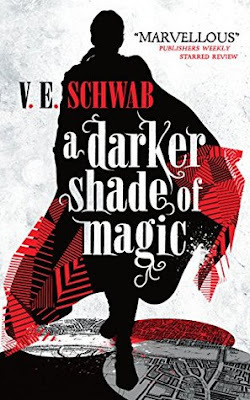 Magic's darkness and subtleties are also pretty big draws for me in fantasy novels, so I need to check this one out. 'Cover grazer' - what an awesome phrase. :D Yeah, the whole point of a cover is to draw in readers, so we shouldn't be ashamed of our appreciation for them!